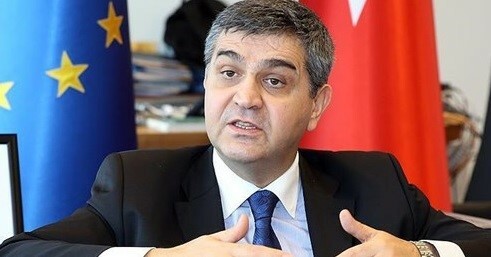 Deputy MOFA Kaymakcı was born on 21 March 1968 in Tosya, Kastamonu, Turkey. Graduated from the Economics Department of the Faculty of Political Science of Ankara University, he had two Master’s Degrees from the London School of Economics and College of Europe (Brugge) in the field of economics and politics of the European Union respectively. He worked at the Turkish Ministry of Foreign Affairs in Ankara at the Directorate General (DG) for International Economic Organizations, DG Balkan States (1994-96), DG Policy Planning (2002-03) and DG European Union (2008). Abroad, he served at the Turkish Embassy in Tripoli (1997-99), at the NATO Senior Civilian Representative’s Office in Kabul (2004-05) and three times at the Turkish Permanent Delegation to the EU in Brussels (1999-02, 2005-08 and 2017-2018). He was the Chief Foreign Policy Advisor to Turkey’s EU Minister and Chief Negotiator and Director for EU Communication at the EU Ministry (2008-11). He served as the Consul General of Turkey in Basra from 2011 to 2013. In October 2013 he was appointed as the Ambassador of Turkey to Iraq where he remained in office until January 2017. He was the Permanent Representative of Turkey to the European Union, between February 2017 and August 2018. He was appointed as the Deputy Minister of Foreign Affairs & Director for EU Affairs on 7 August 2018. Deputy MOFA Kaymakcı is a holder of NATO Medal for his service in Afghanistan and was selected one of the three Alumnus of the Year 2007 of the College of Europe.